But suppose you want to find two different kinds of text formatting and replace both with a common format. For example, wherever there's Arial or Courier New text use Georgia instead. That's going to be two sets of Find/Replace, but today you only have to specify the Replace criteria once. If you had only 1 reset button then you'd have to specify the Replace criteria twice. You do not need to reset your example. After the first query, all you have to do is change the font and restart the query. Reset is not necessary. What I mean is, when you start a NEW query, you have to press the reset button twice. If there were a general reset button that resets both settings, you would not need to open both option menus. It is not a big adjustment, but with many queries it saves a few annoying clicks. 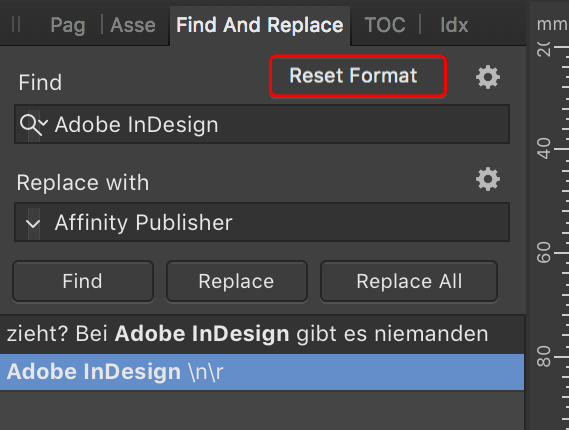 In addition, it could not happen that a setting on find or replace is forgotten to reset.